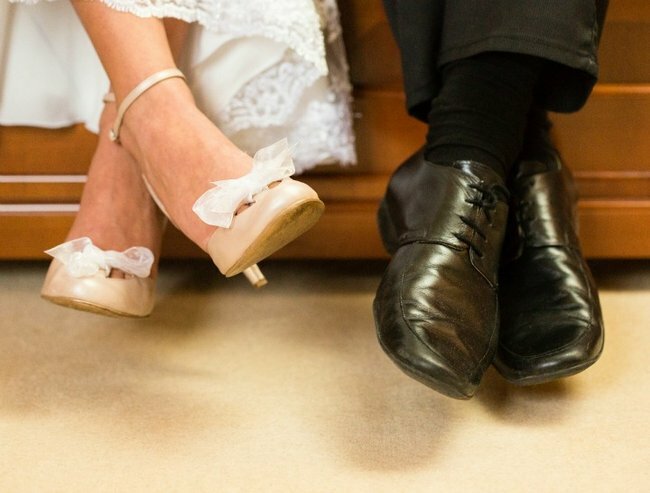 Is bad marriage better than no marriage when you have kids? "I would've been happier if I'd never got married." By: Michelle Horton on Your Tango. I sometimes joke that my husband and I had an arranged marriage … arranged by the universe. That’s a flowery way to look at the situation for what it was: Getting knocked up accidentally and then marrying the baby daddy. Of course, we didn’t have to get married, but I loved my boyfriend very much (still do) and we wanted to be a proper family forever. We wanted to make this sh*t work for the long-haul, come hell or high water. No one forced us into our nuptials with a cocked-and-loaded gun — not a person, and not the universe. If I wasn&apos;t pregnant then, would I still be married now? Image via iStock. But in some strange way, it does feel a bit orchestrated. If certain events didn&apos;t happen — our birth control didn&apos;t fail, I went and got the morning-after pill, I decided to terminate the pregnancy — I may not be married right now. I was only 22 at the time. Without a family to keep together, without the higher stakes of a marriage commitment, without a reason to say "I do," I may not have. I may have bounced when times got hard, and no one would&apos;ve faulted me for it. Not when money was tight, or when doubt crept into my mind, or even when my partner&apos;s self-destructive habits started to chip away at my own life. Without realising it at the time, those legal documents entangled my life with a man who was just about to spiral into the true depths of human suffering — a near-fatal drug addiction — and I was along for the ride. "I was along for the drug-fuelled ride." Image via iStock. My therapist recommended to get away from that toxicity immediately and let him implode on his own. If I wasn&apos;t already so invested in this relationship and if we didn&apos;t share a child together, I don&apos;t think I would&apos;ve stuck around once money disappeared from the accounts and lies engulfed me in a soupy darkness. But because he was my husband and the father of my child, I slipped into denial and enabling and all of the comfy co-dependent trappings I didn&apos;t know were inside me. I lived through hell. Absolute f*cking hell. Things are much better now, now that we&apos;re both in recovery. Our bond is stronger than I ever thought humanly possible. But still, these have been some hard years of marriage. "Happy" doesn&apos;t come to mind, not in the least. It&apos;s been eye-opening and interesting and complex, but happy? Nah. But because that turn to the path of motherhood and matrimony was so sharp and obvious, it&apos;s easy to look back at that exact point of divergence and think, what if. What if I continued down the route I was on — the one where my husband eventually turned into my ex? The one without first-grade soccer practices or stretch marks or seven years of marriage experience under my belt? What if. Would I have been happier? Author Cheryl Strayed would call that my "sister life" — the path I didn&apos;t choose, but easily could have. Kind of like a sliding doors moment. "I&apos;ll never know, and neither will you, of the life you don&apos;t choose," she wrote in her popular Dear Sugar column. "We&apos;ll only know that whatever that sister life was, it was important and beautiful and not ours. It was the ghost ship that didn&apos;t carry us. There&apos;s nothing to do but salute it from the shore." When I stand on the shore and look out to that ghost ship, carrying my former self to a totally different life, I do think l would&apos;ve had a happier seven years. That&apos;s terrible to say, but it&apos;s true. My marriage didn&apos;t make me happy. If anything, it made me downright miserable. I wouldn&apos;t have cried so much. I wouldn&apos;t have so many resentments to unpack. I wouldn&apos;t have known how deep this well of unhappiness can go. Not yet, at least. I imagine that sister life to be more buoyant and free, only responsible for my own needs and wants, which would&apos;ve been lovely and in its own way, important. It sounds nice. And yet, if I had been on that ghost ship avoiding the years of pain, I would&apos;ve missed a lot of other things, too. I wouldn&apos;t have the strength and clarity that I was forced to develop, or the boundaries I learned how to build for the first time in my life (it was a matter of survival, after all). I wouldn&apos;t recognise the deep co-dependence that unknowingly flavoured every relationship in my life, and was the true source of my unhappiness — much more than my marriage. There&apos;s a lot of amazing relationships besides marriage. Image via iStock. I wouldn&apos;t have the compassion that comes from intimately knowing a struggling person fighting for his life, and peeking at the humanity behind the stigma of "addiction." I wouldn&apos;t so clearly see the subtle addict in all of us, in myself. A good chunk of my marriage was marked with lies and delusion — such is the nature of drug addiction — but now, having lived through that I can better see the bullsh*t when it&apos;s right in front of me. Not just in my marriage, but in life, in my own head. I now know how to protect myself from absorbing the issues and problems of the world, something I never recognised before this marriage. My idea of happiness used to be contingent on another person. As long as my partner was loving/supporting/cherishing/fulfilling/[fill in the blank], then I could be happy. That wasn&apos;t available to me in this marriage. But because I chose this route, I actually learned the most important happiness lesson of all: How to be happy when absolutely nothing is going the way I want. How to be happy while living with a person who not only couldn&apos;t deliver happiness to my feet, but was busy wallowing in his own pain. And if I could learn to be happy through THAT — through uncertainty and heartache and fear — then I may have found a more sustainable happiness to keep with me no matter where this ship heads next.